A low moan escapes from a decaying jaw. A brief glimmer appears in your lifeless eyes. What remains of your nose catches a tantalizing smell. 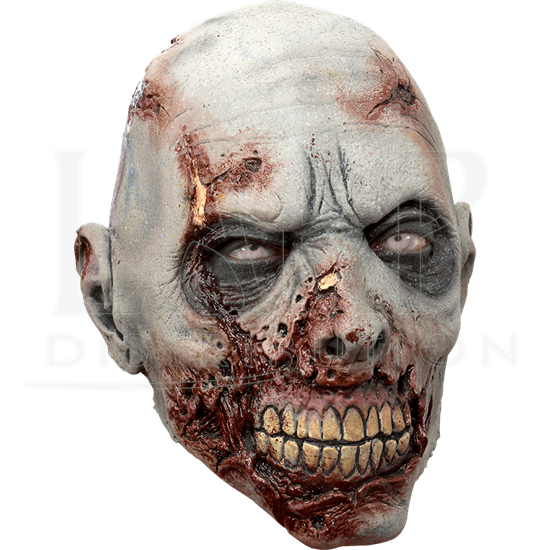 With the Grey Scarface Zombie Mask, you continue your ravenous pursuit of human brains. Grey skin hangs off facial features caught in mid-decay. Dark lines and wrinkles encircle the eye openings. Bloody, torn flesh and yellow teeth mark what remains of the mouth. Dried blood and patches of broken skin mar the hairless crown. Few masks can compare to the sheer fright value that this Grey Scarface Zombie Mask offers, making it a great way to shed the shackles of life to become a member of the walking dead.